For the first time in 40 years, a set of Amazona guildingii parrots, the national bird of St. Vincent and the Grenadines, that were bred overseas will be returned to the country. 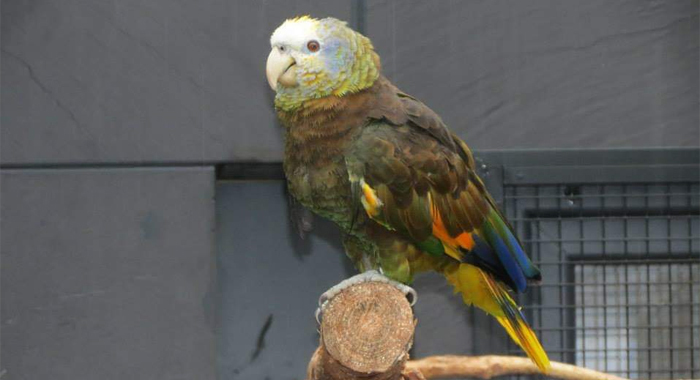 The two male parrots were bred in Germany at the facilities of the Conservation of Threatened Parrots (ACTP) facility. Their parents were taken there from SVG and the offspring will be flown home at the end of March. Senior Forestry Supervisor, Cornelius Richards said that the seven-year relationship between the government of SVG and ACTP has evolved to the stage where the reciprocal transfer of birds from Germany to St. Vincent can commence. Amazona guildingii is endemic to SVG and was declared as the National Bird in 1979. The parrot’s plumage is consistent with the colours of the national flag, strengthening its image as a true icon of Vincentian identity. The species inhabit the interior mountain forests and rainforest areas of the 133-square-mile mainland of St. Vincent. The main population is located within a 10,400-acre sanctuary, established by the government in the central core of the island. According to a population census conducted in 2010, the wild population is estimated to be around 850-900 birds. Despite an increase in the number of birds, from approximately 400 in the early 1980s, the current population still remains a long way from 3,000-plus birds that inhabited the forests during the 1960s and 1970s. The SVG government along with forestry officials realised the need for the conservation of the endangered birds because of the deforestation of the prime parrot habitat in the National Parrot Sanctuary for the cultivation of marijuana and destruction of a parrot habitat in the Upper Perseverance Valley. The negative effect that Hurricane Tomas had, in 2010, on the parrot population and its habitat as well as the trough system of 2011, demonstrated the need for additional options to safeguard the parrots from extinction. Despite a number of failed attempts to have an effective parrot conservation programme and assisting entity, the plight of the species did not go entirely unnoticed and so in 2006, ACTP, an NGO out of Germany, presented a proposal to the Government of SVG to enter into a technical partnership to conserve the national bird, both within and outside of its natural habitat. Over the next five years, the relationship between both agencies evolved gradually, giving time for a solid partnership to develop. ACTP fulfilled all expectations of the Government regarding a workable strategy for the nation’s flagship species and the conservation of the species was entrusted to them in 2011, a press release said. This was marked by the historic signing of an agreement for technical cooperation on Oct. 7, 2011. On Dec. 16, 2011, ACTP received 15 St. Vincent parrots from the Government of SVG. The birds were transported to Berlin, Germany via the Dominican Republic. This marked the first phase of the movement of birds under the Breeding Loan Agreement (BLA). It was also agreed that a second phase will allow for the reciprocal transfer of a number of birds from ACTP to the SVG Government. The release says that while in Germany, the parrots are professionally managed by the staff of ACTP as well as co-opted services of a veterinary team from reputable institutions. The parrots go through a quarantine process to check for any diseases before being housed at the ACTP facility. The entire operation meets requirements of the Bundesamt für Naturschutz (Federal Agency for Nature), the agency representing the interest of CITES in Germany. In the case of St. Vincent, management is carried out by the trained staff of the Forestry Services with the support of the Veterinary Officers of the Animal Heath and Production Division. “The seven-year relationship between the government of St. Vincent and the Grenadines and the Association for the Conservation of Threatened Parrot (ACTP) has evolved to the stage where the reciprocal transfer of birds can commence from Germany to St. Vincent. This will be the first time in over 40 years that any St. Vincent Amazon Parrot will be returned to its native country,” Richards said. He said that the Government of SVG acknowledges that the current conservation focus to reciprocate the St. Vincent parrot is necessary, practical and timely and that it is being undertaken with the understanding that these birds will serve to enrich the local gene pool, therefore ensuring viability of the local stock on the island. He said the birds that would be arriving will eventually be integrated into the local stock, forming two viable pairs. “More birds are to follow as the breeding in both countries advance, further enriching the local breeding program,” Richards said. He said that with the birds, comes a new agreement for further technical cooperation with ACTP. 3. Improve on the existing ex-situ captive stock for the St. Vincent Parrot at the Nicholls Wildlife Complex in the Botanical Gardens, ensuring its viability by upgrading existing breeding facility and further advancing towards a genetically sound breeding program for the species to parallel that of the breeding program in Germany. 4. Improve co-management of the existing ex-situ captive stock in Germany through the effective collaborative management of the breeding loan program established in 2011. 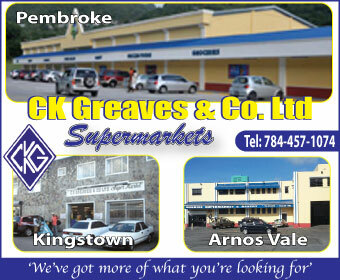 Richards said that with these new areas of focus, the future of the endemic St. Vincent Parrot is secured. “The government is committed to strengthen the technical partnership with ACTP,” said the senior forestry supervisor. • Rehabilitation work in the National Parrot Sanctuary (above critical water catchment areas) which were impacted by Hurricane Tomas and the extreme trough system of April 2011. • Three 4-wheel drive vehicles to support the Forestry Services’ Wildlife Management, Law Compliance and Forest and Wildlife Education through a school T-Shirt parrot conservation campaign. • Training for three officers at the associate degree level in forest management at the University of Trinidad and Tobago. • Supported forest and wildlife education through a school t-shirt parrot conservation campaign. • Supported sustainable livelihood project as an alternative to deforestation. • Supported GRULAC hosting in a regional convention for birds where crop predation in parrots (an emerging issue for concern at a national level) was the major focus. Mr. Chance, how is it that you always “happen” to be in the wrong place at the right time? Or not. The old people had a racist term for what you observed which we inherited from our slavemasters and their free mullato emulators which I can’t repeat here. Will they be released in the wild?